Ryan enjoyed the video for the most part and liked how the video showed riding outside of just dirt jumps. I wanted more than just one person’s opinion so I asked another snowboarder and minishred aficionado Cooper Thomas. Coop is seen here showing why I wanted to hear from him. 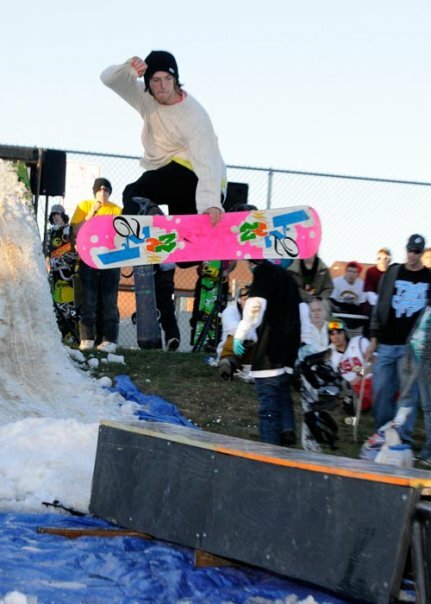 Coop is a sponsored snowboarder who regularly wins jib contests. Coop has also been the Maryland state downhill mountainbiking champion and has taught mountainboarding at his local ski resort in the summer. Seemed like a proficient background of all things action sports to gain a perspective of the video. Coop’s opinion wasn’t as stoked as Ryan’s. Let It Happen from DirtStar_Army on Vimeo.